Studio/singer YC6 may be used either single or double bed simply by repositioning one piece. It includes a 4 color tension unit, a special sinker plate, and a set of cards which are only for DBJ. It has a 4 button yarn changer, can be set for automatic 2 color changing. Brother/knitking comes with a supplementary two color yarn mast, a special sinker plate, and a four button changer. A button must be pressed for each color change. It sits where the ribber setting plate usually does, so the ribber and in turn the plate its bracket slides into on the left side of the machine need to be removed. To color change on Studio the next color button is pushed/selected when the KC is on the right, in Brother the button for the next color selection is pushed after the KC is in the yearn changing area, after the audible “click” produced when the carriage has traveled far enough. The wires and tension units exert more tension on the yarn than standard tension units, which affects gauge so if one is knitting garments, the units should not be changed while working on the same piece, nor should calculations for gauge be used if they were produced in the same yarn, but using the alternate tension unit. 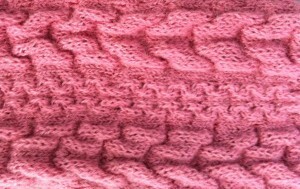 Tension may have to be raised by at least one number or more to prevent dropped stitches and obtained desired feel/drape. If a carriage jam occurs, the sinker plate needs to be removed before using the release lever for KC. If using for fair isle: in single bed FI knitting normally the contrast color, corresponding to punchcard holes (black squares on mylar, or pixels, depending on machine and programming) is placed in the B feeder, and background yarn in A. When using the color changer the manuals will state that the main color is normally in B while the contrast color is in A, where it can be changed automatically. However, that depends on which part of the design is to include the color striping. If it is to occur in the motif, the card needs to be modified by being punched in reverse. 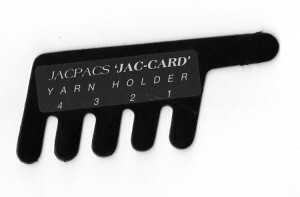 If the striping is to occur in the background, standard card and position may be used. If one wishes to alternate, both ground and motif may need to be punched separately. 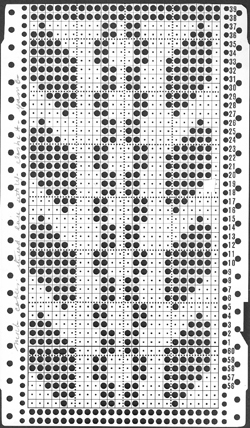 More than 2 colors per row require color separations of the original design for knitting with slip stitch setting, one color at a time, in 2 row sequences. The double bed color changer is used often for DBJ with color separated cards though other fabric options are possible. It may also be used for single bed work, but the ribber must remain raised and the ribber connecting plate is used. This means that single bed fair isle is not possible, because there is only one feeder in the ribber connecting plate. 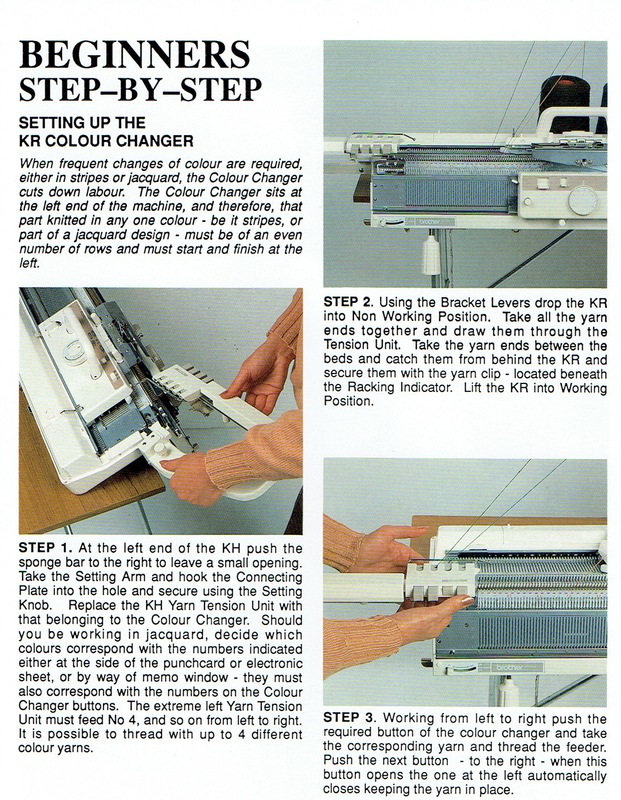 Using it is a viable option for knitting striped patterns on the bulky machines. There are no brushes to help anchor knitting in place like the ones in the single bed sinker plate however, so even though the fabrics may be worked only on the top bed, careful weighting is required ie in color tuck/slip mosaics etc, knit with color changes every 2 rows. I have read that Toyota did not have a color changer due to their built in simulknit facility, automatic DBJ, but only 2 colors knit in any one row. Sometimes metal parts/wires get bent in storage or handling even on ribber sinker plate, and may need a bit of bending and tweaking if colors are not getting properly picked up. Some Brother color changers have small adjustment screws under the arm that may loosen, and change its alignment to the needle bed, which is easily solved by adjusting/tightening the screw. Sinker plates should be cleaned and may be adjusted if required, just like the standard ones. High tech version: 1 : set up 2 in use Automatic knitting system based on the Brother KH-970, consisting of a knitting machine Brother KH-970, set for the ribbing attachment KR-850, KE-100 motor drive and automatic color changer KRC-1000E (6 color changer). The image below is a lo tech “color changer” marketed beginning decades ago, and still available online. It is not practical to use with DBJ knitting because of the issues involved with removing the yarn from the ribber sinker plate in order to switch colors, but can be an alternative for working single bed on multiple gauge machines. 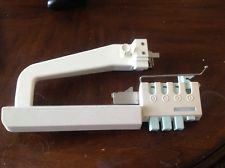 It provides a way of holding the yarns that is easier and more successful than some of the other “creative” options for knitters who do not yet own a color changer accessory appropriate for their machine. I had begun this post eons ago, and somehow it became a UFO. A recent discussion on ravelry re using elastic yarns, brought this swatch to mind, and here is the start of a return to the cable pretender category. Big Pretender: this fabric is thread lace, using elastic for one yarn, and a very fine mohair for other: a useful fabric for tightly fitting garments or garment sections, without the hand transfers or the rigidity of an all over cabled item. The positions for the 2 yarns are reversed, so they both will knit the unpunched areas of the card, and where there are punched holes the elastic will create floats, pulling on the knit only stitches in the alternate yarn, creating the surface blistering. 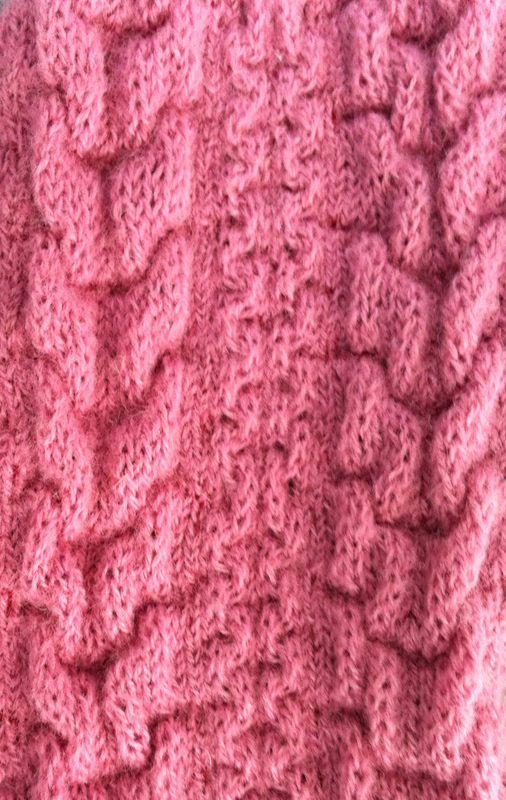 Some suggestions for working with elastic yarn: the nature of the fabric created when knitting with elastic ie in FI is greatly affected by the yarn used, the elastic used, and the pattern being knit. Larger swatches than usual are required to estimate gauge for use of the resulting fabric in garments, at least 100 sts by 100 rows. If using a pre drawn motif, doubling width and height may be a quick way to make up for “shrinkage” of pattern. As with all fussy yarns make certain the elastic flows freely and is not getting hung up on the bottom of the cone. Sometimes if loose tension is not enough to make it manageable, the upper tension dial may be bypassed completely. Edges of fabric will be cleaner if the elastic knits on the end needles at least every other row. This is one fabric that benefits by use of weights. Steaming helps the elastic to spring back after finishing the piece, test small areas and best temp on your own iron. A series of publications using a technique published much earlier in japanese books as swatch samples “magic cables” by Ricky Mundstock, tuck stitch and hooking up / ruching stitches combine to create the illlusion.